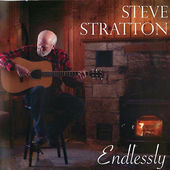 Endlessly by Steve Stratton. Empire Media Group, 2014. In a world dominated by commercial pop and synthesized sound, one finds comfort in discovering musicians still dedicated to the skilled instrumentation and lyrical complexity of more pre-modernized music. This album revisits some of the more old-fashioned ideals of life and happiness in the individualistic society we now live. The focus often concerns the struggles of finding love and happiness in life. Though these ideas are nothing new as subjects for song-writing, this collection nonetheless provides a fresh perspective on what has proven to be a successful focus in the music industry. The style of singing has a down-to-earth personality, providing a fresh and inviting interface for the listener to form connections. Tapping into the warm yet upbeat qualities of folk-rock, Steve Stratton’s Endlessly is a welcome addition to those looking for both relaxation and sophistication in their music. The feelings expressed during the listening experience are often balanced between remorse and anticipation, though the intensity is mild and in no way overpowering or overwhelming. It is rather an invitation for listeners to reminisce in similar situations concerning failed or lost relationships, or to encourage the pursuit of happiness regardless of shortcomings. Acoustic guitar chord progression and the mellow vocals of Steve Stratton tend to dominate the compositions, where his personality seeks to mellow the listener and remind them of the need for having healthy connections in life as well as a strong purpose: A great representation of Midwestern-style music. Cory Widmayer is a graduating senior with strong interests in folk and rock music and a passion for finger-style guitar. A rewarding listen for anyone who enjoys electric folk-rock with intelligent lyrics and a solid band backing Steve and his guitar on his compositions. And a great way to remember Steve, for those of us who were priviliged to know him. Great review of a great music CD. Steve’s music is joyous and reflective much as he was. Thank you for reviewing Endlessly and for letting others know about Steve’s music. Beautiful man. Clear, mellow voice. Absolutely wonderful guitar! Yes, a wonderful example of true and sincere expressions of love and life- gentle, fun and completely unpretentious. Thank you Steve. Thank you Cory. Joel, you said it perfectly. Right-on! Very nice review of Steve’s album. I hope this helps to introduce more people to his wonderful music. Steve has left his legacy of music for us all. Steve’s music reflects his character: mellow, open-hearted, generous, seeking. The world needs more music and more people like this! On target review of Endlessly. Steve Stratton’s lyrics and music are stirring and bring his personality easily to mind. Wish there more ! What a wonderful album! In addition to the its being musically strong, I like how much Steve’s loving essence and gentle humor shines through every sound morsel of the CD. This album beautifully showcases Steve’s ample vocal and guitar skills – a real treat to listen to. Thank you for the spot on review Cory. I love listening to this album — when I’m sad, happy or in-between. Steve covers the bases of life, love and loss with a spacious heart that shines in his words, voice and music. If you need a gift for a loved one who is sad, happy or in-between, this is it. Wonderful review. Steve’s album is a calming gift which shows his relationships as key to living life. His legacy is well captured. THank you! I love “Endlessly” (and I loved Steve.) It currently sits in my car CD player. I’m a news junkie, but when I want music, I choose Steve’s album. Great review, thanks to my cousin for bringing it to my attention.